Seated portrait of Peter D. Thomas (1847-1925) of Racine. Thomas was an escaped slave who joined the 15th Wisconsin Regiment during its service in Tennessee. 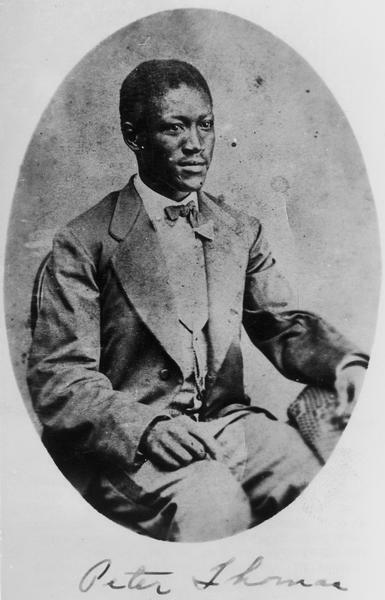 Thomas served Lt. Charles B. Nelson of Co. G at Chickamauga and other battles, then enlisted in a USCT regiment. Later he followed Wisconsin troops back to Beloit and attended school there. In time he made his home in Racine and was elected Racine County coroner. See also Image ID: 33613.